The fifth season aired on Sundays at 9:00 pm ET in the United States. 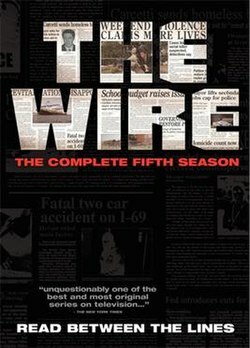 The season was released on DVD as a four disc boxed set under the title of The Wire: The Complete Fifth Season on August 12, 2008 by HBO Video. HBO announced on September 12, 2006, that a fifth and final season consisting of 13 episodes—but later reduced to ten—had been commissioned. Production for Season 5 officially began on April 30, 2007. Filming wrapped early in the morning of September 1, 2007 and the first episode aired on January 6, 2008. At the Night at the Wire event on June 9, 2007, Simon stated that Detective Sydnor is the only character who remains morally clean by the end of the show, but not perfectly since "after all, this is The Wire." He also hinted that Mayor Carcetti might make a run for governor. The series continued the show's examination of the devaluing of human life and institutional dysfunction. The increased scope of the season to include the media allowed this theme to be explored through an examination of "the people who are supposed to be monitoring all this and sounding the alarm — the journalists." In particular Simon has spoken about the devaluing of the reporter in terms of downsizing a newspaper staff and the management expecting to do "more with less" when he asserts that in reality, you can only do "less with less." The series realism has been reported as being maintained particularly through the accurate dialogue and use of contemporary slang. Series creator David Simon further expanded on the thematic content of season five in an interview with Fancast/Inside TV. Critic David Zurawik saw the unifying theme of the season as "public and private lies," particularly those perpetuated by the media and told by Jimmy McNulty in protest against cutbacks in the police department. TV Guide writer Matt Roush also saw the central theme as lies and characterized it as "deeply and darkly ironic." A preview for Season 5 of The Wire aired on HBO on October 28, 2007 and was later made available on YouTube. HBO sent critics the first seven episodes on DVD in December 2007. HBO's On Demand and multiplatform marketing division approached creator David Simon about producing exclusive on demand content and three short prequel clips were produced that take place prior to the linear storyline of the show. The clips were made available via Amazon.com from December 5 and through HBO's on demand service from December 15. The first video takes place in 1962 and focuses on the school days of drug kingpin Proposition Joe; the second is set in 1985 and focuses on Omar Little making an early robbery; the third video is set in 2000 and shows the first meeting of Jimmy McNulty (played by Dominic West) and Bunk Moreland (Wendell Pierce). The clips aired after Season 5 episodes as they premiered starting January 6, 2008. At that Night at the Wire event, fans were allowed to tour the Baltimore Sun newsroom constructed for the show. The real newspaper allowed the show to use their name but stipulated that no current employees could appear in the series. The newsroom was an entirely built set constructed at the show's out-of-town soundstage. The actual Washington Post newsroom was also featured, as one reporter visits for an interview. The Wire is the first production to be allowed to film at the location; even the film All the President's Men about the paper's role in breaking the Watergate scandal had to build a set to represent the paper. New starring cast member Clark Johnson as editor Augustus "Gus" Haynes. It was rumored in August 2007 that Homicide: Life on the Street stars Richard Belzer and Clark Johnson would guest star in the fifth season. Johnson was later confirmed as joining the starring cast to play Gus Haynes, "a city editor who tries to hold the line against dwindling coverage, buyouts, and pseudo-news." The New Yorker described an early scene from the season where Haynes rants about a reporter inserting a charred doll into scenes of fires to eke more sympathy from his readers. Johnson also directed the final episode of the show. In the episode "Took," Belzer made a cameo appearance as John Munch, the police detective he has portrayed since 1993 on Homicide (1993–1999) and Law & Order: Special Victims Unit (1999–2013). The majority of the starring cast from the fourth season returned. On the police front, Dominic West returned as Jimmy McNulty with a larger storyline than the fourth season; John Doman as Deputy Commissioner William Rawls; Seth Gilliam as Western district Sergeant Ellis Carver; Corey Parker Robinson as Major Case Unit detective Leander Sydnor; Deirdre Lovejoy as prosecutor Rhonda Pearlman; Clarke Peters as veteran Detective Lester Freamon; Wendell Pierce as veteran homicide Detective Bunk Moreland; Lance Reddick as Colonel Cedric Daniels; and Sonja Sohn as Detective Kima Greggs. In the political storyline, Aidan Gillen returned as ambitious Mayor Tommy Carcetti; as well as Reg E. Cathey as political aide Norman Wilson; and Domenick Lombardozzi as troubled defense investigator Thomas "Herc" Hauk. In the street, Jamie Hector returned as West-side drug kingpin Marlo Stanfield. Also returning for the street storyline were Andre Royo as heroin addict Bubbles; and Michael K. Williams as underworld legend Omar Little. Former recurring characters who joined the main cast were Tristan Wilds as Michael Lee, Gbenga Akinnagbe as Chris Partlow, Jermaine Crawford as Duquan "Dukie" Weems, Isiah Whitlock, Jr. as corrupt State Senator Clay Davis, Michael Kostroff as defense attorney Maurice Levy, and Neal Huff as Mayoral chief of staff Michael Steintorf. In addition to Johnson, joining the main cast in the journalism story line were Tom McCarthy as morally challenged reporter Scott Templeton and Michelle Paress as reporter Alma Gutierrez. Season 4 main cast members Frankie Faison, Jim True-Frost, Robert Wisdom, and Chad L. Coleman, who played Ervin Burrell, Roland "Prez" Pryzbylewski, Howard "Bunny" Colvin and Dennis "Cutty" Wise, respectively, had recurring but not starring roles in the season. Other returning guest stars included Steve Earle as drug counsellor Walon; Anwan Glover as Slim Charles; Robert F. Chew as drug kingpin Proposition Joe; Method Man as drug lieutenant Melvin "Cheese" Wagstaff; Felicia Pearson as the eponymous criminal enforcer Felicia "Snoop" Pearson; Chris Ashworth as former enforcer for the Greeks Sergei "Serge" Malatov; Wood Harris as fallen kingpin Avon Barksdale; Marlyne Afflack as city council president Nerese Campbell; and Amy Ryan as McNulty's domestic partner Beadie Russell. The return of guest stars from past seasons was described in reviews as a reward to loyal viewers. New recurring guest stars included David Costabile, Sam Freed, Bruce Kirkpatrick, Todd Scofield, Kara Quick, and Donald Neal. Continuing the show's trend of using non-professional actors and real-life Baltimore figures, several ex-Baltimore Sun reporters appeared in recurring roles. Rebecca Corbett, who was Simon's former editor at the Baltimore Sun and now works at the New York Times, had a recurring role. Writer and former political reporter William F. Zorzi gained further screen time after his season 1 cameo. Steve Luxenberg, the editor responsible for hiring Simon at The Sun, also had a role. Simon's wife Laura Lippman also appeared as a reporter in an early scene alongside Michael Olesker, another former Sun reporter. Baltimore attorney Billy Murphy appeared as a lawyer for corrupt Senator Clay Davis, and former senator and current radio host Larry Young conducted a fictional interview with the character. Former police commissioner Ed Norris returned in his recurring role as a homicide detective with the same name. Creator David Simon continued to act as the show's executive producer and show runner. Nina Kostroff Noble once again served as the show's other executive producer. Joe Chappelle reprised his co-executive producer role and continued to direct episodes. Ed Burns once again served as a writer and joined Chappelle as a co-executive producer. Karen L. Thorson returned as a producer. George Pelecanos produced the sixth episode of the series only - his first production work since the third season. Political journalist William F. Zorzi continued to write for the show and guide the political storylines. Acclaimed crime fiction novelist Pelecanos returned as a writer and contributed his seventh episode to the series. Pelecanos's fellow crime novellists Richard Price and Dennis Lehane also returned as writers. Chris Collins returned as a staff writer and contributed his first script. David Mills contributed an episode, completing the writing team. New star Clark Johnson also helmed the final episode after previously directing the pilot. Other returning directors for the fifth season included Ernest Dickerson, Anthony Hemingway, Agnieszka Holland, Dan Attias, and Seith Mann. Series star Dominic West made his directorial debut. Husband and wife directing team Scott and Joy Kecken were also first time directors on the fifth season. The fifth season received widespread acclaim from critics, scoring 89 out of 100 based on 24 reviews on Metacritic. Matt Roush of TV Guide favorably reviewed the series calling it "brilliantly bleak" and a "landmark series." Brian Lowry of Variety characterised the series' look at the media as the most realistic portrayal of a newsroom in film and television history. However, Leigh Claire La Berge found that "in the popular press [...] the level of critical anticipation that greeted that season was matched only by the immediate disappointment that followed it", noting that the season is The Wire's most explicitly didactic, the one that most obviously comments on the series's own fictionality, and the one with the least realistic plot. Thus in reviewing the first seven episodes of the fifth season David Zurawik of the Baltimore Sun said that while "there is greatness in the seven episodes," the major newspaper storyline "contain[s] nothing that matches the emotional power and sociological insight of the show at its best." La Berge argued that it is precisely the fifth season's capacity to explore the social construction of realism itself that is the season's most important characteristic. All episodes except "–30–" were made available by HBO six days earlier than their broadcast date, via On Demand. The Stanfield Organization continues to operate despite a year of surveillance by the Major Crimes Unit. Education budget deficits and ambitions to become Governor leave Mayor Carcetti forced to make funding cuts. His broken promises to the police department destroy morale and cause the closure of the Major Crimes Unit. Detective Jimmy McNulty is sent back to homicide and returns to his old habits of drinking and infidelity. Similar cutbacks in the Baltimore Sun newsroom make it increasingly difficult for city desk editor Gus Haynes to do his job but he is still able to break a major story linking city council president Nerese Campbell and drug dealer Fat Face Rick. Bubbles is recovering from his heroin addiction but is struggling to come to terms with his role in Sherrod's death. Michael Lee continues to work as a Stanfield enforcer and provides a home for his younger brother and his friend Dukie Weems. Reporter Scott Templeton submits an unverifiable story about a boy attending the opening day of the Baltimore Orioles baseball season. Haynes is dubious but is forced to run the story by his senior editors. The withdrawal of the police investigation emboldens Marlo Stanfield and he orders several murders and tries to contact international drug trafficking organization "The Greeks". Detective Lester Freamon continues to observe Stanfield even though he has been assigned to the Clay Davis corruption case. Bubbles takes a job at a soup kitchen. McNulty becomes increasingly frustrated in the underfunded homicide unit and takes the drastic step of faking a homicide with the intention of drawing funds to the department by creating the illusion of a serial killer. Stanfield turns to "Proposition Joe" Stewart for help cleaning and laundering money while Stewart remains unaware that Stanfield is trying to usurp his connection to The Greeks. Stanfield also places a bounty on information leading him to Omar Little. Cheese gives Stanfield the whereabouts of Omar's advisor Butchie. Chris Partlow and Snoop torture and kill Butchie to lure Omar from retirement. Stanislaus Valchek leaks unmodified statistics from the police department to Carcetti and tells him that commissioner Ervin Burrell is falsifying the numbers giving Carcetti the political ammunition he needs to fire Burrell. Carcetti leaks a story heralding Cedric Daniels as a potential replacement. Daniels is worried that Burrell will reveal his shady past after Templeton invents a quote implicating Daniels in Burrell's departure. McNulty continues to work on his serial killer plan despite warnings from his partner Bunk Moreland. Bunk enlists Freamon to talk to McNulty but is dumbfounded when Freamon offers to help with the plan. Freamon and McNulty draw more attention to their fake serial killer by sensationalizing the murders. McNulty's compulsive behavior jeopardizes his relationship with Beadie Russell. Campbell learns of Daniels' history but convinces Burrell to leave quietly with the promise of a comfortable replacement position. Sergeant Ellis Carver puts his principles first in the Western District and his former partner Herc is shamed by his integrity. Stanfield convinces The Greeks to consider him an insurance policy and continues to assimilate Stewart's contacts including Maurice Levy. Omar returns to Baltimore and quickly learns that Stanfield was responsible for Butchie's death. Stewart prepares to leave town fearing reprisal from Omar but is once again betrayed by Cheese and murdered by Partlow as Stanfield watches. Stanfield takes over as The Greeks' Baltimore distributor and is given a phone and a code to use to contact them. Stanfield gives the number to Levy and Herc steals it and passes it on to the police department. Freamon appeals to Daniels for a wiretap but is unsuccessful. McNulty leaks further details of his invented serial killer to the press and the story gains momentum. When Templeton stages a phone call from the serial killer McNulty uses it as probable cause for a wiretap. Freamon sets up on Stanfield's phone while the homicide unit believe they are manning another, disconnected, wiretap of the killer's phone. Dukie struggles with bullying and searches for a new path. Bubbles learns that he is HIV negative. State's Attorney Bond announces the Davis corruption case. Campbell convinces Davis to protect his fellow politicians and he embarks on a publicity campaign suggesting that his race has motivated the charges. Partlow sets up an ambush for Omar which he narrowly escapes by jumping from a balcony. Omar hides and tends to his injured leg overnight and then resumes robbing the Stanfield organization. Stanfield assumes control of the New Day Co-Op, telling the members that Omar was responsible for Stewart's death. Stanfield promotes Cheese, raises the price of narcotics, and suspends further meetings. The police find sealed courthouse documents in Stewart's house and realize there is a leak somewhere. Freamon enlists Leander Sydnor to man the wiretap and realizes that Stanfield is communicating with picture messages and McNulty abducts and photographs a homeless man in order to provide probable cause for picture intercepts. Templeton writes a follow-up story about a homeless Iraq veteran and draws the praise of his superiors, for once including Haynes. Bunk remains frustrated with McNulty's scheme and begins to make progress working his old cases the traditional way. Carcetti delivers a rousing speech about the serial killer and decides to spin homelessness into a core campaign issue. Freamon and McNulty stage a call from the killer to Templeton and send him the photographs to get the picture intercept equipment they need. Carcetti authorizes resources for the investigation and McNulty finally has the funds he hoped for. Bunk interviews Michael about the vacant murders but learns nothing. Omar attacks more of Stanfield's people and damages his reputation on the street at every opportunity. After a spectacular courtroom performance Davis is acquitted of the corruption charges. Kima Greggs reconnects with her ex-girlfriend's son. Haynes investigates his suspicions about Templeton and learns that Templeton has lied about his reporting. Former Baltimore police detective John Munch (of Homicide: Life on the Street and Law & Order: Special Victims Unit) briefly visits Kavanaugh's Bar. Partlow keeps word of Omar attacking Stanfield's name from Stanfield. Omar goes to a corner store to buy some cigarettes and is shot to death a young drug dealer named Kenard. The Iraq veteran comes forward to complain that Templeton fabricated details of their discussion and Haynes is shocked that Templeton's misconduct involves even this story; Haynes misses the story of Omar's death. Bunk finally gets a murder warrant on Partlow with a little assistance from McNulty. McNulty asks Carver to provide a surveillance team for Freamon using the serial killer funding and with the extra manpower Sydnor breaks the communications code. McNulty cannot stand to see Greggs spending time on the serial killer case and he admits inventing the killer. Russell warns McNulty that she will leave him if his behavior continues and McNulty comes clean to her too. Dukie finds work with street vendors who collect and sell scrap metal. Carcetti fends off a challenge for the democratic nomination from Prince George's county and is forced to make promises to Davis, Campbell, and a congressman from the county. Freamon tracks Partlow to a Stanfield resupply and makes multiple arrests including Partlow, Stanfield, and Cheese. Carcetti holds a press conference to celebrate the arrests. Stanfield is suspicious of an informant and orders Snoop to kill Michael. Michael realizes the danger, murders Snoop, and goes into hiding. Suddenly homeless, Dukie moves in with the street vendors. Stanfield learns that Omar used his name on the street and is enraged. Greggs goes to Daniels about McNulty's actions. Bubbles celebrates a sobriety anniversary and reporter Mike Fletcher writes a profile about him. Haynes launches a more thorough investigation into Templeton's lies. Daniels tells Carcetti that McNulty fabricated the serial killer. Fearing for his campaign, Carcetti orders a cover-up and Daniels is angry but accepts the orders for the sake of the careers of those peripherally involved. Freamon learns that Levy is involved with leaking courthouse documents to drug dealers and tells Pearlman. McNulty and Freamon decide to retire when Pearlman warns them that they are going to be re-assigned to dead-end units. Levy realizes the Stanfield investigation relied upon an illegal wiretap. As part of the cover-up, Pearlman negotiates a deal with Levy; Levy will escape charges for the leak, Stanfield's charges will be suspended and he will go free but be forced to leave the drug game, while the others in custody will plead guilty to the charges. Stanfield sells the connection to The Greeks back to the Co-Op and plans to become a businessman. Daniels refuses to falsify statistics to help Carcetti's election campaign. Campbell brings up his past to blackmail him into compliance but Daniels instead elects to stand down and begins a new career as a defense attorney. For their part in the cover-up, Pearlman and Rawls are rewarded with promotions; Pearlman becomes a judge and Rawls is made State Police Superintendent. Michael becomes a stick-up artist. Dukie begins using heroin. Carcetti goes on to become governor, Campbell replaces him as mayor and promotes Valchek to commissioner. Kenard gets arrested. ^ "The Wire - 5th & Final Season: Release Date, Bonus Material, Cost & Early Package". TVShowsOnDVD.com. April 2, 2008. ^ John M. Higgins (September 12, 2006). "HBO Renews The Wire". Broadcasting & Cable. Retrieved January 25, 2012. ^ a b c d Meghan O'Rourke (2006). "Behind The Wire". Slate.com. ^ David Mills (February 28, 2007). "Just to tease you fans of The Wire…". Retrieved March 14, 2007. ^ a b c Wiltz, Teresa (September 3, 2007). "Down to "The Wire": It's a Wrap for Gritty TV Series". Washington Post. Retrieved September 3, 2007. ^ a b c d e f g h i j k l m n o p q Margaret Talbot (2007). "Stealing Life". The New Yorker. Retrieved October 14, 2007. ^ "One on One with David Simon". Retrieved November 2, 2007. ^ a b c d e f David Zurawik (2007). "Fact and fiction, down to The Wire". The Baltimore Sun. Retrieved December 7, 2007. ^ a b c "Urban Renewal for L&O and The Wire". TV Guide. 2007. Archived from the original on May 8, 2008. Retrieved December 19, 2007. ^ "Preview of The Wire Season 5". Retrieved November 2, 2007. ^ Charlie McCollom (2007). ""The Wire" returns". San Jose Mercury News. Retrieved December 7, 2007. ^ Kevin Thompson (2007). "Merry Christmas to me! "The Wire" comes early!". Palm Beach Post. Retrieved December 7, 2007. ^ a b Andrew Wallenstein (2007). "HBO's "Wire" plugs in VOD vignettes". The Hollywood Reporter. Archived from the original on May 27, 2008. Retrieved December 7, 2007. ^ a b Sean O'Neal (2007). "HBO offers free "Wire" prequels". A.V. Club. Retrieved December 7, 2007. ^ a b Oscar Dahl (2007). "HBO releases three prequel videos for "The Wire"". Buddy TV. Retrieved December 7, 2007. ^ a b "HBO'S 'The Wire' Preps Back Stories: Three short films will precede launch of fifth season in January". EUR Web. 2007. Retrieved December 7, 2007. ^ a b Amy Argetsinger and Roxanne Roberts (June 5, 2007). "The CIA Has A New Man On a Special Mission -- to Hollywood". The Washington Post. Retrieved October 20, 2007. ^ Oldenburg, Ann (August 5, 2007). "Belzer character Munches more scenery". USA Today. Retrieved August 8, 2007. ^ "Just to tease you fans of "The Wire"..." Undercover Black Man. February 28, 2007. Retrieved February 28, 2007. ^ a b c d e f g h i j k l m n o p q r s t u v w x y z aa ab ac ad ae af "About the Show". HBO. 2007. Retrieved December 12, 2007. ^ a b "HBO Re-Hangs 'Wire' in January". Zap 2 It. 2007. Retrieved December 7, 2007. ^ a b c d e f g h i j k l m n o p q r s t "HBO's Award-Winning Drama The Wire Returns to Movie Central and The Movie Network For a Fifth and Final Season". Movie Central. 2007. Retrieved December 7, 2007. ^ a b c "Season 5 crew". HBO. 2007. Retrieved December 12, 2007. ^ "The Wire season 3 crew". HBO. 2007. Retrieved October 14, 2007. ^ "The Wire: Season 5". Metacritic. Retrieved February 23, 2011. ^ Brian Lowry (December 21, 2007). "'The Wire' gets the newsroom right". Variety. Retrieved December 22, 2007. ^ Leigh Claire La Berge, 'Capitalist Realism and Serial Form: The Fifth Season of The Wire, Criticism, 52 (2010), 547--67 (at pp. 549--50); DOI: 10.1353/crt.2010.0046 [repr. in Reading Capitalist Realism, ed. by Alison Shonkwiler and Leigh Claire La Berge (Iowa City: University of Iowa Press, 2014), pp. 115--39]. ^ "'The Wire' loses spark in newsroom storyline". Baltimore Sun. 2007. Retrieved December 30, 2007. ^ "The Wire episode guide - episode 51 More with Less". HBO. 2008. Retrieved January 22, 2008. ^ "The Wire episode guide - episode 52 Unconfirmed Reports". HBO. 2008. Retrieved January 22, 2008. ^ "The Wire episode guide - episode 53 Not for Attribution". HBO. 2008. Retrieved January 22, 2008. ^ Zurawik, David (January 24, 2008). "Viewership for HBO's 'The Wire' declines". The Baltimore Sun. Retrieved October 21, 2017. ^ "The Wire episode guide - episode 54 Transitions". HBO. 2008. Retrieved February 5, 2008. ^ Yanan, Travis (January 29, 2008). "Last Night's Results: Sunday 1/27/08". Programming Insider Feedback. Archived from the original on February 1, 2008. Retrieved October 21, 2017. ^ "The Wire episode guide - episode 55 React Quotes". HBO. 2008. Retrieved February 5, 2008. ^ "The Wire episode guide - episode 56 The Dickensian Aspect". HBO. 2008. Retrieved February 29, 2008. ^ "The Wire episode guide - episode 57 Took". HBO. 2008. Retrieved February 29, 2008. ^ Full cast and crew for The Wire: Took, IMDB.com. ^ Yanan, Travis (February 20, 2008). "Last Night's Results: Sunday 2/17/08". Programming Insider Feedback. Archived from the original on February 27, 2008. Retrieved October 21, 2017. ^ "The Wire episode guide - episode 58 Clarifications". HBO. 2008. Retrieved February 29, 2008. ^ "The Wire episode guide - episode 59 Late Editions". HBO. 2008. Retrieved March 10, 2008. ^ "The Wire episode guide - episode 60 –30–". HBO. 2008. Retrieved March 10, 2008. ^ Levin, Gary (March 11, 2008). "Nielsens: 'Runway' finale rules on cable". USA Today. Retrieved October 21, 2017.